If you are looking for a fun filled, juicy and an healthy delight, then this small thela located in Vile Parle is all set to soar the bar with its four berry juice. With true fruits and really rich ingredients, you literally get the best in this four berry juice, and that too at a very minimal cost. The stall, Hari Om Juice Centre, gets such exotic fruits from Trikaya which are the sources of all the luscious and essentially flavorful delicacies that are served here. The most loved one is the four berry drink for sure! 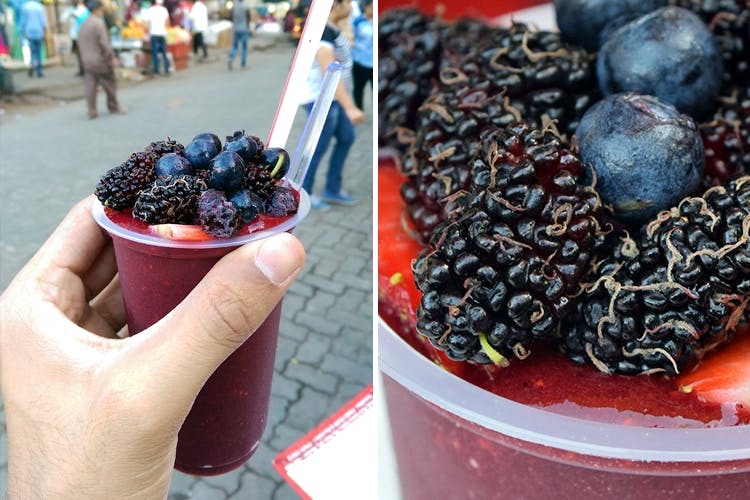 Blended with strawberries, blueberries, cranberries and loads of mulberries, this drink tastes as good as it looks, and will cost you INR 240. Natural and soulful, this drink is a great choice post workout or even on a refreshing day. They also serve varieties of dragon fruit, passion fruit, avocado, and plum juices. The summers are kicking in and this juice is the perfect way to combat this heat.